If anything, the notion of finding your first job and actually finding it can be pretty daunting. The process is not only time consuming but you need to be out and out dedicated to doing so. At a stage where your CV is at its possible lowest, you’ve not appeared for too many job interviews and you do not have any kind of industry exposure, you might think it would be difficult to find any job let alone your dream job. There will be nothing more disappointing than not being able to showcase your strengths in an interview to your prospective employer. The point is to know your strengths and weaknesses by now. You are old enough to apply for jobs, so old enough at the very least to know about yourself. Before starting to apply for jobs, take out a little time for yourself. Do some soul searching and see what kind of things you excel at and where your weaknesses lie. This will not only be helping you out for that first job but also many that you will apply for in the future. You will be able to achieve a lot more when you have options. 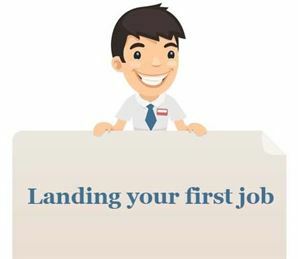 To reach that much desired result of landing a job, know this that applying for just one gig will not get you through. Talk to friends, alumni, peers, family and the placement cells at your college and know for sure that you are applying to the right kind of companies. You need a job! That’s your priority, period. East, sleep and work ways in which you can get that job you want. A sugar coated CV and applying for a job will not be getting you that job. You will have to work towards it. Start reading newspapers, read research articles, attend industry events, and other such activities to set the goal in motion. You need to be aware of what is required of you in a job that you are applying for in order to start working for it. What experience do you have doing _____? Chances are that if you prepared really well for the interview then you will probably get the job. At the same time you should be prepared for no. Don’t take it to heart. It is just the beginning of your career and is not the end of the world if you don’t get this job. You should never put all your eggs in one basket. That is probably why you should not be applying to only one company for a job and should never bank upon a single recruiter to offer you that job. There are plenty of other opportunities for candidates starting afresh which include internships, freelance jobs and starting your own business.